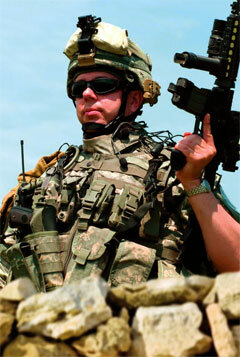 ODU supplies a range of advanced military connectors for all purposes of the soldier modernisation programmes. All systems used by infantry soldiers in the field must function 100% and the soldiers must be able to count on this. 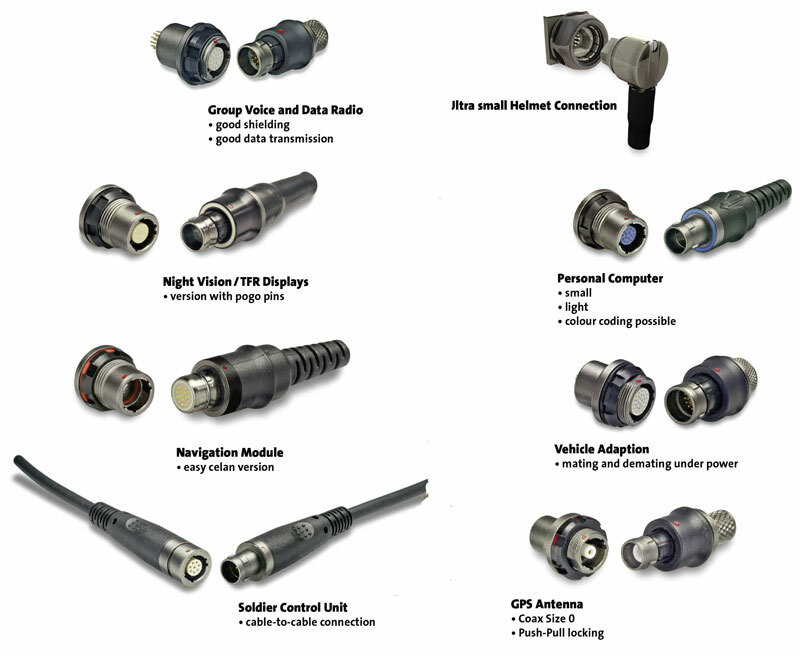 This is why it is especially important that all components used, from the connector to the cable to the complete information systems, satisfy the highest quality standard. Globally, there are some 40,000 connectors in use in the military and security engineering sector, and while all have their advantages, they are not suitable for all the requirements that will have to be met in this area in the future. Equipment manufacturers must build smaller and lighter, and this naturally means compact and light connectors. The right information at the right place and the right time can mean the difference between life and death. As a rule, connectors are responsible for transmitting this information, which is why no compromises should be accepted in their quality. Small, light and rugged - this could be a short requirement specification for the connection systems needed for the various “Soldier Modernisation” programmes. As in many other branches, this area is creating a great challenge for connector manufacturers, because even these compact connectors must ensure reliable power transmission and EMC protection and satisfy many additional requirements. Thanks to its many years of know-how in military technology, ODU offers several ingenious solutions for “Soldier Modernisation” programs. Customers here have access to standard solutions as well as to customer-specific developments. ODU offers the connection systems that fit the specifications and application. An extremely short connector from the ODU MINI-SNAP Push-Pull series is new. The “Super Shorty” connector is up to 20% shorter than a standard connector and consequently also lighter. The Super Shorty is currently available in size 0 (with an outside diameter of 9.4 mm) and size 1 (with an outside diameter of 12 mm). Contact arrangements with up to 14 positions are available as standards. 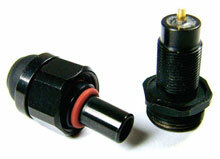 The connectors have a black and matt chrome surface that makes them ideal for military use. The customer has two versions in two series to choose from: The version from Series B (coding with pin and groove and locking with locking fingers) and a version from Series F (coding with half-shells and locking with locking fingers). There are also connectors with push-pull locking or in a break-away form. The new connectors are completely plug compatible with the standard receptacles from the familiar ODU MINI-SNAP series, which means that there is no need to exchange receptacles that have already been installed. The new Super Shorty can easily be used when inserted. The new connector’s standard protection is IP 68 with respect to the terminal device’s tightness. 360° EMC protection is also available upon request. A further standard solution is the new ODU AMC (Advanced Military Connector) product series which has been designed especially for military technology. 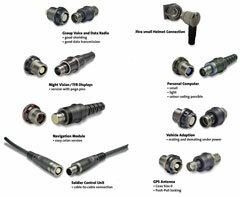 More than just a single connector, this is a complete product series. Six sizes with up to 55 contact positions are available as standards. The connection systems have been equipped with mechanical and color coding. The special feature here is that the color coding is only visible when the connector is not plugged in. The combination of color and mechanical coding makes incorrect plugging practically impossible. The user can choose between a version with secure Push-Pull locking and one with a break-away function. 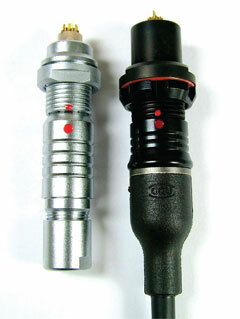 Both connector versions can be inserted on the same receptacles, allowing maximum flexibility. The company has also included an “Easy-to-Clean” version as a standard in the product portfolio. The inserted pressure contacts allow rapid and easy cleaning of the connector in the field. Dust, dirt and mud cannot harm this connector. The customer can also choose among various sizes and contact arrangements here. Rounding out the new product series are 360° EMC protection, inserts for transferring data rates according to various protocols, and special versions, such as for “hot plugging”. Standard solutions often do not satisfy all the specifications that are needed for a particular application. In such a case, do not settle for a standard solution that is almost right - talk to ODU. As a specialist for customer-specific solutions, ODU can provide a completely new connector that meets all requested requirements. As a system supplier, ODU offers more than just the connection systems. The company also takes over the complete assembly for its customers, including cable and extrusion. As a result, the customers have a complete system, and only one contact person. One question often heard in the area of cabling is, “What about wireless?” This is certainly a legitimate question, but this is not a topic for discussion at this time. The risk of a system breakdown is simply too high, and naturally this is a risk that no one wants to take. It would also be necessary to integrate additional transmitters into the device, which would only further increase the weight of the soldier’s equipment. ODU AMC including assembly and extrusion Miniature cylindrical connector with screw locking | Very compact construction – only 24 mm long | Protection class IP 68 - Watertight to 2 m | Connects light-laser modules to weapon systems - tested in the field. | Straight and right-angle models available. IP68-key button for flashlights in military area and Law Enforcement. This key button replace extension cable and protective covers.